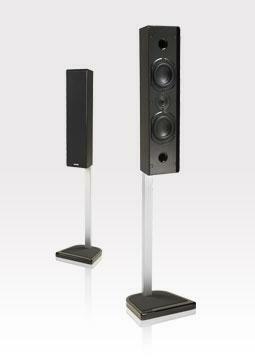 Tryptix marry form and function in a stylish on-wall loudspeaker. Using dual 100mm bass drivers and a 26mm super audio tweeter the Tryptix present depth and clarity unsurpassed in a speaker of this type. Available in high gloss black, white or silver the Tryptix are designed to complement plasma / LCD installations or for any application where space is a consideration. Matching floor and table stands are also available making the Tryptix a highly versatile experience. The term ?lifestyle? is used a lot these days with AV components and it can often mean a lot?s been put into the look rather than the performance. Krix?s new Tryptix addresses both in equal measure. They?ll look good on the wall or native stands next to a shiny Plasma or LCD flat panel, but more importantly these are ?proper? home theatre loudspeakers.